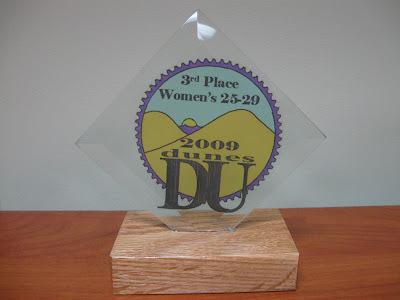 The Dunes Duathlon this Saturday may have been under gray skies, but it was a total blast! I either got 2nd or 3rd in my age group, depending on which results you look at. The day of the race, they named me third, but the results that they emailed us today named me second. Either way, I'm not complaining! I'm very happy. I really felt great out there during the whole race. It was a good day. The race was small - about 150 people total. We did a mass start, which really created a feeling of commeradery - everyone taking off down a little stretch of road, then turning onto the trail into the woods. They told told us before the race that if we didn't fall down in the sand or over a root somewhere, that we weren't running hard enough. What fun! During the five mile trail run, I was able to keep up a good pace. I feel like the constant ups and downs of the dunes kept me interested and distracted from how running actually felt. I would stretch it out on the downhills, and then just push up the uphills without letting myself slow down too much. And the adrenaline of running with other people helped, too. It was a really fun trail running course - except for the two LONG uphills through the sandy dunes area. Fortunately, everyone ahead of me walked up those hills, so I didn't feel bad doing the same. It's funny when you think, "I'll walk a little up this hill and catch my breath," but then at the top you never caught your breath at all. Yeah, sand! My shoes were so full of sand after those hills that I actually contemplated stopping to take them off and dump them out! And in the midst of all this contemplation, I missed the split second opportunity where we skirted the edge of the woods for a few feet and could look up and see lake Michigan beyond the beach. Oh, well. I'm told it was a blur of gray skies and gray waves. Then suddenly, I rounded a corner and popped out of the woods into the transition area. I know I ran 5 miles, but it didn't feel that long. That's a good thing! So, I trotted over to my bike, changed into my cycling shoes, helmet, gloves and sunglasses and snarfed down half a granola bar. Then I jogged my bike across the timing mat and hit the road. My time for the run plus transition was 46:44. I'm sure I was in the transition area for more than 1:44, so that means I ran under 9 minute miles. Not bad for so little running preparation before the race. I had lots of energy left when I got on the bike, so I just settled into my drops and kept a steady burn in my legs for the whole 17 miles. The race organizers stopped traffic for us at intersections, which was awesome! I may not have ridden much during the last month of the summer, but I still felt strong on the road bike. I completed the bike portion of the race in 57:40, which works out to something like a 17.7 mph pace. My total time for the race was 1:44:24 for a place of 100th overall. That was well under my goal time! I liked the distance of this race. It was long enough to feel challenged, but not so long that I didn't feel like I could actually push myself the whole time. I want to do another duathlon! It was so much fun! My co-worker, Jared, and his wife, Tammy, also did the race with me. They attempted their first triathlon a couple weeks ago and both had to stop during the swim. So, they were eager to finish the duathlon for a little bit of redemption. Jared said that he kept me in his sights for most of the run, but lost me toward the end. Tammy was having some foot and ankle trouble, so she just kept a slow and steady pace to be careful of her footing. She came in 4th in her age group. Jared made up some time on me in the bike portion, and ended up rolling across the line about 2:40 after me. Nice work, you two! Jared took some pictures of us at the race, which I'll post as soon as he sends them to me. Even though it looks like most duathlons are in a run + bike + run again format, which I don't like as much as the run + bike, I am definitely going to plan to try a couple more duathlons next summer! I'm sure I'll find some fun ones with more trail running and great scenery. That's one of the great things about Michigan. Great job, and Congratulations! Thanks for the detailed report. Sounds like it was an awesome event! Chip, I'm all jacked up on Mountain Dew!